The final Incident and the Epilogue occur, chronologically, right after one another, so it's hard to say where one begins and one ends if not for a certain location change. So that's likely why the epilogue felt so long to you. I'm just gonna settle to watch the r-rated version since I just want to see this already. Is there anywhere online that gives at least a rough comparison of differences between the 2 cuts? Mark Kermode is much nicer and has a much more nuanced take on von Trier in this video. On an related note if people know they're going to be upset why subject themselves to something like this? According to their website, and confirmed on their social media, the Mayfair Theatre here in Ottawa will be showing the director's cut on Saturday and Tuesday. Because the everyday nobody craves attention. They'll cry so loud just to get a reaction regardless of posiyive or negative. It's almost as if the people supposedly turned off by this did exactly what Trier wanted them to do. Some of the more...critical opinions I saw of the film made the judgement that the film had no merit based entirely on the content alone and that it deserved to be condemned for simply existing. The question I wanted to raise was whether it was actually the content itself that was upsetting them or whether it was the commentary that von Trier posed about existence and art that made them so upset. I think at some levels it's both but said individuals don't wish to acknowledge the latter. I recall for instance that when Antichrist came out all people wanted to focus on was the more explicit violence rather than say, the brutally ugly portrait of depression with what I thought was an incredible performance from Gainsbourg. The rest of the film didn't matter to them. Only the most violent images did. I don't believe Black & Huge was saying the film itself was a provocation, but rather that "the everyday nobody" - the twitter mob, as well as, presumably, many critics -and their disingenuous "outraged" responses are the problem. Can anyone identify the organ score played as Jack and Verge descend at the beginning of the epilogue? The end credits don't give me much of a clue. Is it possibly an organ arrangement of the Bach Partita No 2 listed in the credits? My husband reckoned it definitely wasn't Tristan and Isolde which was also listed. I found the film disturbing and tedious in turns. The image of the house when Jack completes it will stick with me for a long time. I agree with jindianajonz regarding the stuff that the R-Rated version will lack - only the third segment (the one with the child murder/taxidermy) has enough real gore and shock value that I could see it getting significantly cut, though I could see a couple short "aftermath" shots from other segments getting cut as well. Maybe some of the concentration camp footage too, but either way, 99% of the movie seemed acceptable at an R rating to me, and you definitely don't miss anything major in the stuff that did not. Going through this list only reinforces that the removal of these scenes will drastically change the tone of the film, since most of these (with the exception of the pie scene and the mutilation of Jacqueline) served as macabre punchlines for what came before. Incident 2: You see the eroded face for a second--was there anything more than this? Incident 3: You see the kids in the crosshairs but the film cuts away for the sound of each shot. You see a brief mention of pie feeding and taxidermy but it's not shown. Does "family portrait" just mean the aerial view with the pheasants at the top of the frame? Because the camera lingers on that for a while. I was a little confused how Jack went directly from teaching the kids how to hunt big game to shooting them down. Does it play like that in the unedited version? Incident 4: I gather that the unedited version shows him actually slicing them off in Antichrist-level detail? Here you just see her face as she screams, and not for very long. Incident 5: You see the wallet. There was also concentration camp footage in the edited version. 1. Is the film suggesting that Jack became a serial killer essentially because Uma Thurman dared him to? 2. 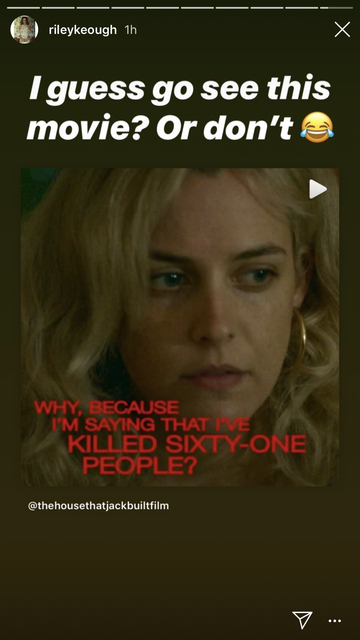 I've seen Riley Keough in seven films now and I still couldn't pick her out of a lineup. 3. It's perfect that the final song is not just you know what but the Buster Poindexter version of it. Incidents 2, 4, and 5 were the same in the uncut version as you described (there's no detail of the breast slicing beyond a brief shot). Maybe the eroded face is shown for a bit longer, but the rest sounds the same. Incident 3 sounds like it was cut pretty significantly, though. It has each of the rifle shots that hit the kids shown graphically. Later, Jack forces the kids' mother to feed one of their corpses pie, which is depicted in closeup, and there's a wider master shot of the four that shows the dead kids and their wounds. Later, Jack taxidermizes one of them sort of on-camera, and you see the results. The "family portrait" is a crane shot of Jack arranging the dead mother and children inside a square made of dozens of dead pheasants, which doesn't seem to have happened in the edited version. There's no smooth transition between Jack teaching the kids about hunting and Jack shooting at them in the uncut version, just a conversation between Jack and Verge bridging the two scenes. Sounds like all of the shots with the dead kids in them were cut, which surprises me given the importance of some of them to the overall incident narrative. In short, Incident 3, and no other incident, seems to have been cut somewhat significantly. You see him carrying the kid into his freezer and talking about doing the taxidermy--it's kind of out of focus in the corner of the screen--and then you do see the end result of the twisted face (here and later in the film). You do see a crane shot of the mom and kids already arranged, but if there's a scene where he's in there arranging it, then that was cut. So it sounds like the biggest most offensive thing in this film was a mom feeding her children pie? I'd like to see that in the ads for the uncut version! Okay, so the taxidermy is there and the pheasant shot is there. All that seems to be missing, then, are the shots of the kids getting killed and the scene, with both closeups and a wider shot, of the (dead and mutilated) kids getting fed pie. Still a significant alteration, but much of the impact and imagery is there. The short shot of the mother crying in the trailer for the uncut version is from the pie scene. So no uncut on demand version is available, then? Of course not, this is all about milking out as much in profits as they can. I'm sure that will become available at the same time as an uncut Blu-ray. so assumed it wasn't shown in any version. Anyway I found this to be both disturbing as a film (every way as brutal and nauseating as Angst), and as one of the saddest confessions by a filmmaker as a way of trying to understand himself. I can't find the right word to attach to this film, but I found it very disturbing and moving at the same time (no easy feat), with only the ending kind of not working as well for me. Last edited by dda1996a on Mon Dec 17, 2018 5:42 pm, edited 1 time in total.